I liked the fact that one of the front desk clerks assisted me with water and cold medicine because I was sick. I didn’t like another front desk clerk indicating g that he was putting me in a room that was on a quiet floor but the room was attached to the fitness center with lots of noise until 10 pm. I didn’t like another front desk clerk overlooking me as I waited in line to speak with a front desk clerk. She purposely chose guests that were standing in line behind me in order to avoid helping me. I didn’t like the fact that the telephone in my room was missing necessary cords that are needed for the phone to work. I couldn’t call the front desk or order room-service from my room. Available parking garage for no additional charge, restaurant and lounge on property. I called to arrange for a pick up from the airport. I was told that the driver is on the way twice and he will be there in about 20 minutes. After 1/2 hr waiting at airport, I called back to ask about the status, I was told that the driver is not coming and what I was told by the staff on the phone was not correct. I asked to speak to a manger, they said no manger on duty. I had to take a Lyft after all. When I get to the hotel it was never an apology or sorry. I asked for extra blankets/sheets, I was told someone will call me back, never a call back. I Am writhing this complain in hope that hotel manger or corporate management take a look at this property. I arrived about 3 am. The manager on duty was very nice and helpful. The next morning I tried to book a room for my return to the area in 4 days. I was told this was not possible as my initial booking was thru a third-party vendor. Too bad. I chose to stay somewhere else. I was at the residence inn across the street in previous nights and it was much nicer. Overall the room was fine for a quick overnight. Bed was comfortable and sheets were clean. The room was quiet. Room and hallways desperately need updating, lots of stains in the carpet and chips in the wall paper. I specifically booked this hotel for the airport shuttle, but it didn’t start until 7, which was not early enough for our flight so had to Lyft anyways. Breakfast also didn’t start until later so if you are an early person you miss out on all of this. Overall under impressed for what I paid. This is an old Sheraton. The wallpaper and carpet is in desperate need of replacement. The furnishings in the room were good to include the bed and linens. It appears like our room was painted but the carpet was not protected and there is paint on the carpet edge all the way around the room. Very bad stains on the room carpet, gross. I will say that the price was indicative of the condition. Everything was great and the hotel staff was very helpful. It was a clean and comfortable hotel for a good price. It was a quick drive to the French Quarter, and a nice quiet place to return to for some good sleep. Nice property. Everything is up to date. Very clean. Stay is great and we were able to check in early since our flight arrived very early in the morning. Stains all over. From the carpet to the iron board. Bring a black light if you stay here. Electric outlets old. Need vents in the bathroom. Bed was comfy. Room service was good. Neighborhood has a bad smell and gets worse in the rooms. The receptionist provided good customer service, but the room was dusty and bed linen had wrinkles and pillows were stained. The bathroom was iffy too. The shower curtains were wrinkled. Then they had people lurking around and were irritating and kids running in the hall. Front desk staff could be a little more friendly. Great stay overall. It was pleasantly nice. Comfy bed, decent gym, nice staff. I went to NOLA for Wrestlemania 34. I had a blast. Everything was ok.
Sheraton Metairie - New Orleans Hotel places you next to Metairie Business District and within a 3 miles (5 km) of Lakeside Shopping Center. This 181-room, 3-star hotel welcomes guests with conveniences like an outdoor pool, a 24-hour fitness center, and free in-room WiFi. Explore the hotel and meet new friends over drinks at the bar/lounge, or enjoy a bite to eat at the onsite restaurant. Savor a meal from the privacy of your room with room service, or get a pick-me-up at the coffee shop/café. Cooked-to-order breakfast is offered for a fee each morning from 7 AM to 10:30 AM. 27-inch an LCD TV are available for entertainment, and guests can stay connected with free WiFi and wired Internet. Pillowtop beds sport premium bedding and the bathroom offers a hair dryer and designer toiletries. Other standard amenities include a coffee maker, free weekday newspapers, and free bottled water. 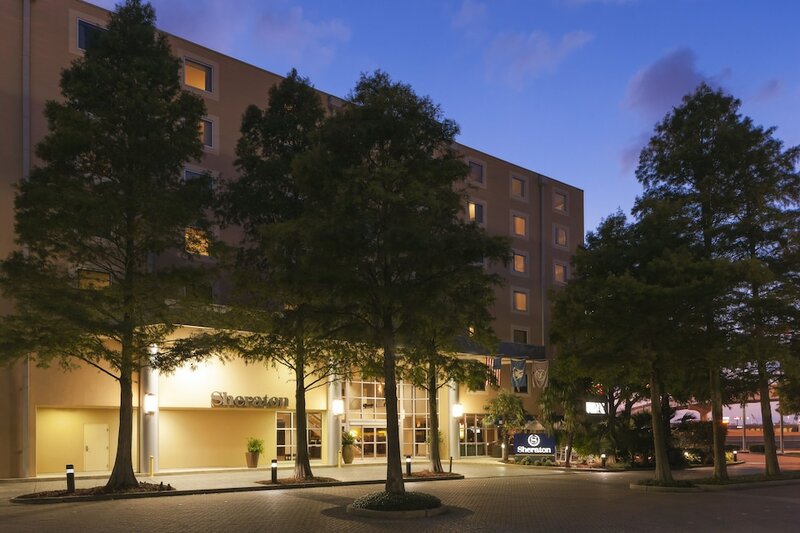 At Sheraton Metairie - New Orleans Hotel, guests enjoy features like an outdoor pool, a 24-hour fitness center, and free WiFi in public areas. There's free parking, as well as a free airport shuttle during limited hours. The front desk has multilingual staff on hand 24/7 to help with dry cleaning/laundry, securing valuables, and concierge services. Additional amenities include conference space, coffee/tea in a common area, and express check-out. Cooked-to-order breakfast is served daily from 7 AM to 10:30 AM for a fee. Recreation features at Sheraton Metairie - New Orleans Hotel include an outdoor pool and a 24-hour fitness center. The preferred airport is New Orleans, LA (MSY-Louis Armstrong New Orleans Intl. ): 15-min drive, 9.4 mi/15.2 km. The front desk is open 24 hours a day, and checking out is easy with express services. For convenient arrivals and departures, you can take advantage of the free airport shuttle (available during limited hours). Driving? This property offers free parking. Airport transportation is available from 7 AM to 10 PM. Fees may apply. Guests must make arrangements in advance by contacting the property. The following credit cards are accepted: American Express, Carte Blanche, Diners Club, Discover, JCB International, Mastercard, and Visa. This hotel provides transfers from the airport. To make arrangements, contact the property with arrival details prior to travel, using the phone number on your booking confirmation. Enchanted Oasis. Five Minutes From The Quarter!